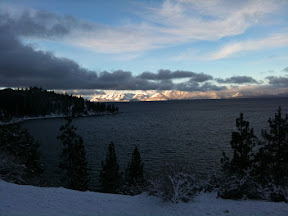 We woke up to like 5 inches of fresh snow on Lake Tahoe's south shore. We decided to drive north up to Northstar at Tahoe for skiing today. It was my first time skiing at Northstar and we had a nice day skiing on the mountain. There was a good 6 inches of light fluffy powder on top of the ski hill which made for nice conditions. Northstar at Tahoe this morning along the east shore.